The set originally included just a necklace and a pair of earrings. 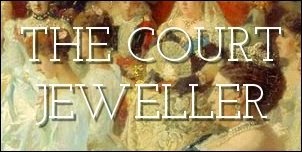 In 1952, the Queen had the necklace shortened, removing one link and having the largest stone removed as well. The bigger sapphire was turned into a pendant seven years later. In the early 1960s, a bracelet was made to go with the demi-parure. The Queen has often worn the set with various diamond tiaras, including Queen Alexandra's kokoshnik. But in 1963, she purchased a diamond and sapphire necklace that had once belonged to Princess Louise of Belgium and had it set on a tiara frame. Today, she generally wears the Belgian tiara with the George VI sapphires as a married parure. The Queen has often worn the sapphires in recent years for evening galas that require jewels but not tiaras. She wore the set twice for parties at the Ritz, once during her Golden Jubilee celebrations in 2002, and again in commemoration of her 80th birthday.